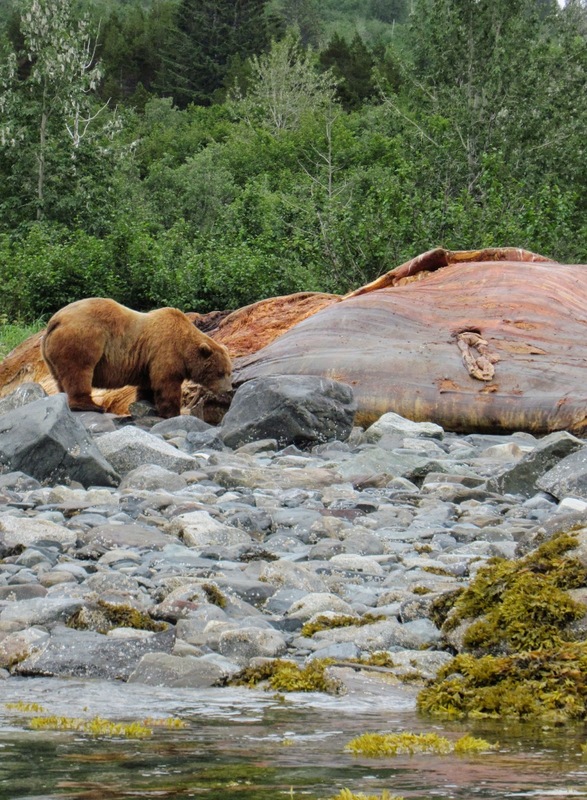 We received a hot tip from Kevin 'Linblad' Freeny that a dead humpback whale had beached itself on a rocky shore halfway up the main channel of Glacier Bay National Park. 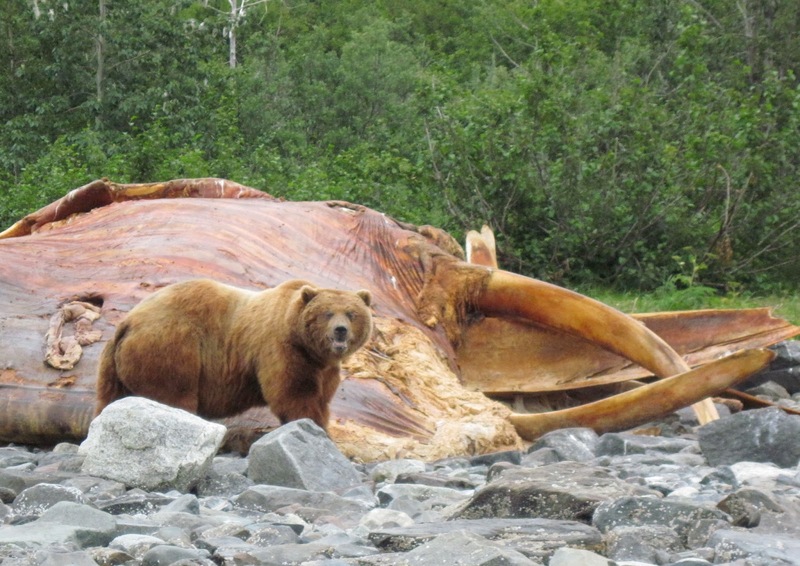 Rumor had it that the whale had become a feeding ground for Grizzly bears and wolves. We sailed into this shore, deployed the kayaks and found a rotating pack of 4 or 5 grizzlies vying for hearty portions of rancid whale blubber. 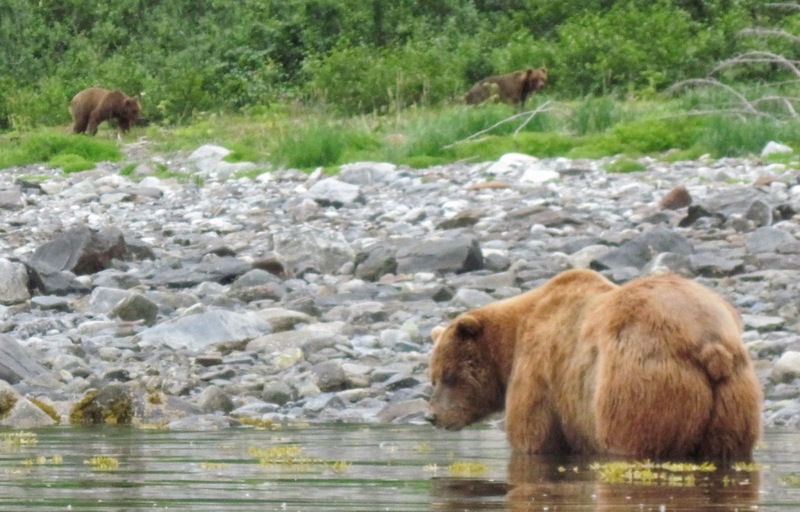 The alpha of the pack stands on hind legs to peer over the carcass and check whether other bears were daring to approach the feast. After determining the others were cowering subserviently at a distance, the alpha returns to the feast. Stopping occasionally to stare blankly at us. and then back to the whale meat. but it is not in the cards today - when alpha is not eating he is patrolling. Alpha continues scraping meat off of the massive whale ribs. Ryan points out another approaching bear while trying to maintain composure. Ryan bought this really nice digital camera that can fit a giant telephoto lens - but Nikon hasn't released the lens yet or something like that - so, with no ability to zoom, Ryan resorted to holding up one end of my binoculars against his camera to get this shot of me getting way too close to the Grizz. 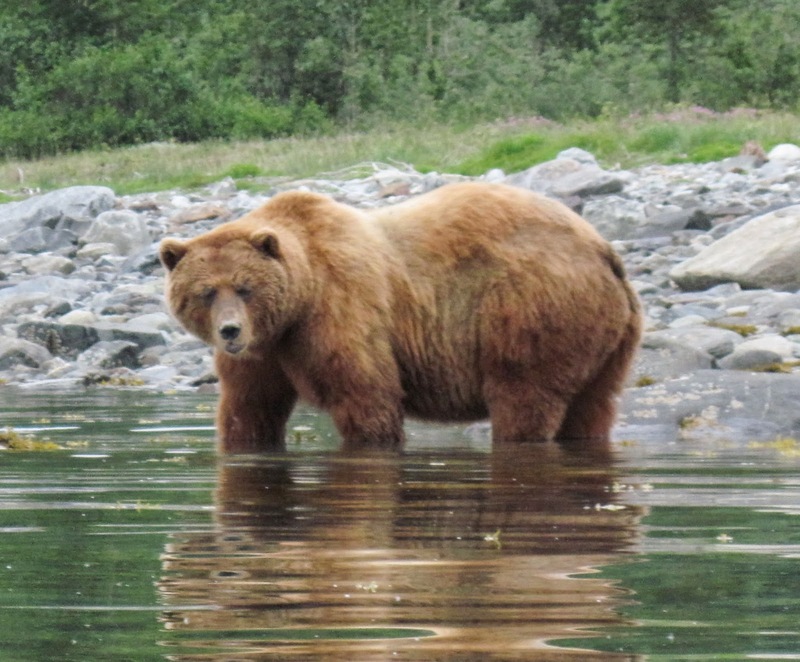 Grizzlies will double their size in the summer time (from 300-400 pounds to 600-900 pounds) as they gorge on salmon, shellfish and the occasional whale carcass - before heading back up the hill to hibernate through the winter. Holy stinking sweet jesus god.